This is a column of mine published last month in The Catholic Weekly. 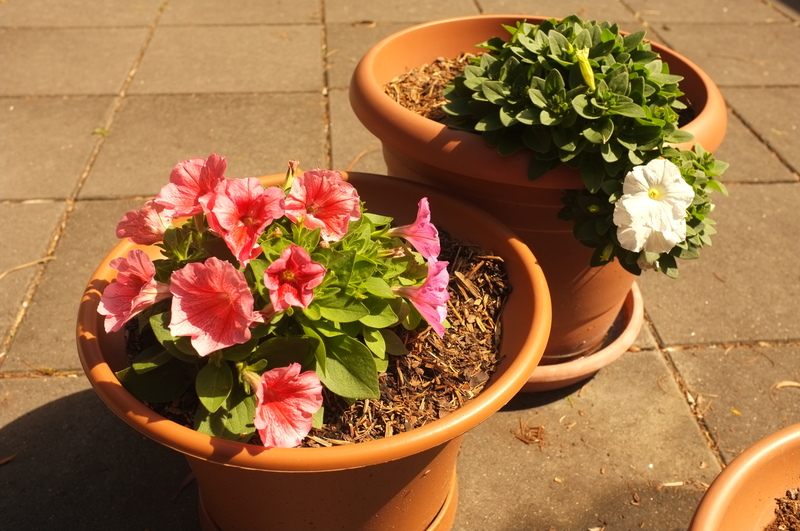 The photo is of the stunning petunias currently at my front door – I planted them last spring and they’ve grown back brilliantly, I didn’t know annuals did that?? This month I helped to run a retreat for mothers at the Mt Carmel Retreat Centre at Varroville, in a semi-rural patch of peace in Sydney’s south west. It was a chance to catch a breather from the everyday run-around of life and immerse ourselves in some quiet and natural beauty. It was also an opportunity to realign ourselves with the gentle, essential, breath of the Church; the daily liturgies of Mass and the prayers of the Divine Office. Most Discalced Carmelite retreats are silent; this time we enjoyed an exception to the norm. As we assembled on the Friday evening I handed out a ‘to-do’ list for the weekend and was intrigued to see which of them the mums reacted to the most. I’d included ten items – simple things like taking a nap, going for a long walk outside, and turning off the mobile phone. My personal favourite was the first suggestion, to physically slow down. To walk slower, breath slower, talk slower, and move more deliberately. And that was the first thing they responded to as well. “We are always rushing,” they said. We do. We rush ourselves, family members and friends, the people we work with, other drivers on the road, everyone we come into contact with, and it becomes not only a habit but what we believe is necessary in order to live. One error we can fall into is the unconscious belief that we live in order to Get Things Done. And that if we can get as many things done that we want and need to do in as short a time as possible then that’s time well spent and a life well lived. We live in order to know, worship and love God. Everything else is secondary. Activity has its place, and through work we can grow in maturity and holiness, but we have to be careful in our over-activity not to lose sight of our ultimate goal – which is God. When we do place our activity above our resting in God and with each other, then our yoke, which Jesus promised would be easy and light, becomes too heavy and hard to carry. The Church in its liturgies, feasts, and solemnities shows us the human way to live. We need times of activity and times of rest – daily, weekly, and seasonally. It’s so easy to miss this, especially when we’re in the flurry of modern family and work life. But back to moving slower. I had an ‘aha’ moment earlier this year when, reading Fr Jacques Phillippe’s book ‘Searching for and Maintaining Peace’, I came across his comment about how our soul can often be ‘re-educated’ by our body. More than 100 years since St Therese of Lisieux’s ‘little way’ of holiness came to light and transformed Catholic spirituality, we can still benefit from remembering that in rushing thoughtlessly through the simple routines and rituals daily life we’re letting pearls fall to the ground, opportunities to be refreshed in peace and grow in love. And as we mothers on retreat found, it’s an easy and light thing to slow down a little to admire and make use of them. Next Post I’m doing a humility experiment this October – want to join me? Thanks so much for this, Marilyn. I needed it! Glad to see you are writing more. Thank you Holly, it’s my regular weekly column at the archdiocesan paper, but I do want to get back to blogging more. I miss it!